Günther Anders (né Stern 1902-1992), a former student of Husserl and Heidegger, is only just beginning to be discovered by Anglophone scholarship. Anders’s main body of work, the two substantial and highly original collections of essays Die Antiquiertheit des Menschen Vol. 1 & 2 (The Obsolescence of Human Beings 1 & 2) emerge from an intricate philosophical anthropology which Anders developed in the late 1920s and early 1930s. In these early texts, the human is conceived as a being that needs to make and define itself with the aid of (technological) artifice. In the ‘Pathology of Freedom’, this notion is summed up as follows: ‘to put it paradoxically, artificiality is the nature of man and his essence is instability. The practical constructions of man and his theoretical faculties of representation testify equally to his abstraction. He can and must disregard the fact that the world is such as it is for he is himself an “abstract” being; not only part of the world (it is this aspect that materialism treats) but also “excluded” from it, “not of this world”’. Anders himself described these early philosophical works as conducting a ‘negative anthropology’, in which the ‘specifically human’ is defined not by any positive quality or essence, but rather through the human’s ‘non-specificity’ and ‘estrangement from the world’ (Weltfremdheit), traits, which force us into fashioning ourselves and the world we are part of with the help of artifice. In the light of his later writings, one way of summing up this intricate early work (which it is not possible to fully do justice to here) is as follows: as humans, we are born obsolete; once born, we inevitably have to leave our negative essence (‘non-specificity’) behind to make ourselves into new beings. Anders’s post World War 2 writings, which differ significantly in tone, aim and trajectory from the early work, rearticulate aspects of this philosophical anthropology into activist analyses of specific technological developments: the atom bomb, TV, space travel, to name just a few. The focus of the post war work is hence no longer on the human as such, but on what artificial structures and technological objects are doing to human life (and the planet it has claimed possession of). Since technology and artifice supplement, amend and thus lead us away from our ‘precise existence’ (being non-specific and indeterminate), posthumanity – “Nachmenschlichkeit” – is the essence of technology. This is one of the conclusions with which Anders revisits his negative anthropology from the perspective of the technological object rather than the human. In place of an outline of the multiple ways in which Anders’s substantial body of work opens radical, unprecedented perspectives on our existence amidst increasingly sophisticated technological objects, I will provide an extract from his writings on the atom bomb that allows a glimpse of the multiple ways in which Anders engages with notions of the “posthuman”: ‘the possibility of our own liquidation is the principle we endow all our technological devices with, regardless of what other special function we entrust them with also. Liquidation is the exclusive principle that informs the construction of machines. For, what we aim at with machines is to produce an effect that does not require our presence or help, an effect that unfolds without lament and complaint (klaglos). What we exclusively aim at are machines, the functions of which, make us superfluous, turn us off, and liquidate us. It is irrelevant that this target condition is only every approximated. What counts is the tendency, and this is “without us”’. The potential that nuclear weapons have to produce a posthuman world, a world in which there is no human life left, is here evoked to illuminate the posthuman world we are already part of. According to Anders, ours is a world in which machines are not just “taking care” of specific tasks, but also of more existential questions. It is hence the emotive connotations of “taking care” – to relieve of worry, responsibility and moral effort – that are of significance here. The atom bomb – a device that can project power all by itself without requiring constant emotive effort – highlights a certain absentmindedness and absent-heartedness that automatically sets in as soon as technology removes us from an act. It is this emotional and affective dimension of our exposure to technological objects, and the impact this has on how we feel about ourselves, others and the devices we use, that Anders’s later works address in particularly original ways. The essay on ‘Promethean shame’, for example, discusses ‘the shame when confronted by the “humiliatingly” high quality of fabricated things’ and so opens an additional perspective on how technological innovation is reconfiguring the manner in which we relate to being human. For Anders, this form of shame not only indicates that we can feel inadequate and superfluous in view of the abilities of increasingly capable machines, but also, and more fundamentally, that we are beginning to be ashamed of being mortal, limited and contingent human beings, rather than being useful, perfectly designed and functional like machines. The tone with which Anders attacks ‘the “technification of our being”’ diagnosed in his post-war writings can leave the impression that these seek to defend traditional notions of human authenticity and integrity against a technological, inhuman threat. It is here, however, that Anders’s writings open us to a most thought provoking problematic: The “human” is under threat not because technology perverts its essence, but precisely because as humans we lack positive determinations and specificities that could counterbalance our turn to technology. Amidst increasingly ‘smart’ machines Anders’s ‘negative anthropology’, which is subtly developed and reiterated in the post war writings, thus opens productive and challenging perspectives on what it means to be and become (post)human. The web portal of the International Günther Anders Society provides a comprehensive biography with photos, links to manuscripts and further information. Selection of recent English publications (up to 2015) on Anders: Christopher Müller, ‘Desert Ethics: Technology and the Question of Evil in Günther Anders and Jacques Derrida’, Parallax, Vol. 21, 1 (2015), 87-102; Günther Bischof, Jason Dawsey and Bernhard Fetz (eds. ), The Life and Work of Günther Anders (Innsbruck: Studien Verlag, 2014); Babette Babich, ‘O Superman! Or being Towards Transhumanism: Martin Heidegger, Günther Anders, and Media Aesthetics’, Divinato 36 (2013), 41-99; Babette Babich, ‘Angels, the Space of Time, and Apocalyptic Blindness: On Günther Anders’ Endzeit-Endtime’, Ethics &Politics, XV, 2 (2013), 144-174; Timo Kaerlein, ‘Playing with Personal Media: On an Epistemology of Ignorance’, Culture Unbound, Vol. 5 (2013), 651-670; Konrad Paul Liessmann, ‘Thought after Auschwitz and Hiroshima: Günther Anders and Hannah Arendt’, Enrahonar, 46 (2011), 123-135; Ernst Schraube, ‘Torturing Things Until They Confess: Günther Anders’s Critique of Technology’, Science as Nature, Vol.14, 1 (2005), 77-85. Günther Anders, Die Antiquiertheit des Menschen 1: Über die Seele im Zeitalter der zweiten industriellen Revolution (München: C.H Beck, 1956); Günther Anders, Die Antiquiertheit des Menschen 2: Über die Zerstörung des Lebens im Zeitalter der dritten industriellen Revolution (München: C.H Beck, 1980). 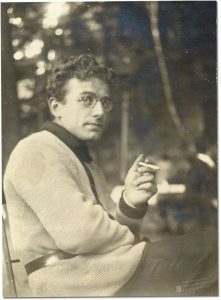 Günther Stern (Anders). ‘The Pathology of Freedom: an Essay on Non-Identification’, translated by Katharine Wolfe, Deleuze Studies, 3 (2009), 278-310, p. 279. Günther Anders, Mensch ohne Welt [Man without World] (München: C.H. Beck, 1993), pp. xiv – xv; my translation. See Günther Anders, Endzeit und Zeitende [End-time and the End of Time] (München: C.H. Beck, 1993), p. 201. See Günther Anders, ‘Über prometheische Scham’, Die Antiquiertheit des Menschen 1, pp. 21-95. An English translation of this essay will form part of Prometheanism (Rowman & Littlefield), a forthcoming monograph in which I engage in more detail with some aspects of Anders’s thought. Günther Anders, Burning Conscience: The case of Hiroshima pilot, Claude Eatherly, told in letters to Gunther Anders (New York: Monthly Review Press, 1962), p.1.